There are some moments in life that can just pass you by, like the first coffee of the morning, or that joke your friend told you that you can’t remember because it wasn’t any good. But there are some that you really wouldn’t want to miss. Here are our favourite moments that really should be committed to film. No matter how your significant other does it – whether they drop to one knee on a romantic trip to the Lake Garda, or even slur those loving words over pizza – being proposed to is a big deal – especially if you, y’know, say yes. And sure, while everyone films the resulting wedding, most people forget about the moment that started it all. Capturing the wedding proposal is a wonderful way to remember just how those blissful years together began. Ok, this might seem like a hard one to judge. Either you film your baby constantly, or you get lucky, but it’s totally magical if you can capture your child’s first steps or words on camera. Sure, you’ll remember the delight forever, running, screaming, calling up your mum and all your friends, but it’d be nice to let others witness the moment too. After all, it’s a big deal. And once you’ve got it on film, you can watch it back 15 years later and wonder what ever happened to that sweet, innocent kid! What could be better than book-ending your kid’s academic career? There are few moments as important as their first day of school, decked out in an ill-fitting uniform, designed to last for years, and a nervous smile. And no parent will want to forget the end of years in education, as they proudly swish their robe and collect their graduation certificates. In fact, it’ll be tough to tell who’s prouder – them or you. If you’ve got any of these moments stashed away on video, relax, they’re not lost forever. If you wish to relive the moment, or cherish and share those memories, then we can definitely help. Here at Video 2 DVD Transfers we specialise in VHS to DVD transfers, and we’d love to help you see and share those moments again. Just contact us on 0800 592433 or email us at sales@video2dvdtransfers.co.uk to find out how we can assist you today. This entry was posted in Gift Ideas, Memories on October 30, 2014 by admin. Are you wondering how you get your order to us here at Video2DVDtransfers? Well we use Royal Mail Tracked Returns. The UK’s most popular Customer to Business shipping service. A services used by 100’s of big names. High Street stores and online companies. Simply download and print off the label from our website (we’ll also send you a link in our emails). Attach the label to your parcel. At the Post Office your parcel will be bar coded and you’ll be given a receipt. We’ll acknowledge receipt of your parcel a few days later. It couldn’t be easier….. and the cost is included in our prices. This entry was posted in Video Transfer News on October 27, 2014 by admin. Preserving memories can be very important, especially when it comes to those all-important precious family moments. Often we are lucky enough to have been able to capture these moments on film so we can come back and relive them over and over again. However in order to preserve these for the future, its important you take good care of your old photos and home videos so they stay in good condition, after all you never know when you might want to see them again. So here we take a quick look at how you can help preserve those precious family memories you have on film, so they can hopefully stay with you and your family for many years to come. The rise of the digital age has seen a move away from more traditional printed photographs and digital archives are now commonplace. Indeed almost gone are the days of getting your camera film developed. However many of us still have numerous old photos lying around of our most precious memories, such as family holidays, and our childhood days. When it comes to protecting and preserving your old photographs there are a number of things you can do to help. For example a number of factors, such as sunlight and high humidity, can damage your old photographs, hence keeping your old photos away from bright light and humid environments is a must. High temperatures can also present a particular problem for you old photos, so when it comes to storing your photographs lower temperatures are preferable. You can also store your photos in good quality photo albums to help preserve them for the future, and these are perfect for having a look through and reminiscing over too. Ultimately it can also be a good idea to make a back up copy of your most precious photos too. For example you could consider digitizing your old photos. There are a number of methods of digitizing your old photos, however for the best quality, using a scanner is usually the best option. Creating a digital archive of your old photos also means you can easily share your photos with others online. There’s nothing quite like catching those all important memories on film; from your baby’s first steps to your wedding day, our home videos speak volumes and are there to be treasured. Home videos have been around for decades, allowing us to forever immortalise and capture our favourite moments and memories. However whilst memories can last a life time, the same cannot be said for you old home movies, at least not if they were captured on VHS that is. VHS tapes were never intended to last a lifetime and in many respects VHS is a dying medium that has all but been laid to rest. Unfortunately VHS tapes wear out a little every time we use them, and over time their components can degrade. Hence if your old VHS home movies are sitting on a shelf somewhere collecting dust, and taking up valuable storage space, a great idea is convert these to DVD, giving them a new lease of life and preserving those memories for the future. Converting your old home movies to DVD can also make the ideal gift, perfect for putting a smile on people’s faces. Here at Video 2 DVD Transfers we are specialists when it comes to converting VHS to DVD and pride ourselves on the high quality of our work. For more information about our great range of services please do not hesitate to contact us and a member of our friendly team will be happy to help you with your enquiries. This entry was posted in Blog, Family, Memories on October 23, 2014 by admin. When people wonder what we do here at Video2DVD Transfers, one of the first things we tell them is how we transfer videos of weddings to DVD. And sure, that’s a key part of any VHS to DVD transfer we perform. Especially since a wedding is one of those special, once-in-a-lifetime moments that people will want to watch again and again for years to come. A lot like a child’s first birthday, or their christening. But that’s not the only kind of movies we convert to DVD. Here are a few more kinds of videos that we can transfer for you. We’ve all seen them, and all pretended to enjoy them. Whether it’s the summer production or the Christmas nativity, your kid took such pride in being on-stage, and we know you did too. Sure, they might not appreciate it so much now they’re older, but you’ll still want to remember that time when they wowed the audience with a flawless reading of ‘To be or not to be…’ There’s an added bonus to getting your kid’s school play put onto DVD too. If something goes wrong, brilliant, you can send it in to You’ve Been Framed too. Before Americans came along and forced the whole prom night-limousine-tuxedo business on us, the disco was the highlight of the school year. Starting the night nervously fiddling with your dress or those cufflinks your mother made you wear, and wondering whether that special someone will dance with you. Ending the night, high on jelly sweets and Tizer, jigging to Spandau Ballet’s True. Good times. You know what they say: if you remember your first school disco, you weren’t there, man. Well, prove them wrong with a DVD copy of the night. Do you remember when you first got hold of a camcorder? How did it make you feel? Excited? Nervous? That you were a budding Steven Spielberg? Hey, we all have to start somewhere. Sure, that homemade movie might seem a bit embarrassing now. I mean, stunt-work basically involves you hurling yourself over the hood of your dad’s car, and special effects consist of cap guns and you and your friends shouting ‘Bang!’ as loudly as possible. But it’d be a shame not to keep a copy, watch it with your mates, or even hide it away from your significant other. That’s why converting them to DVD is a great idea. 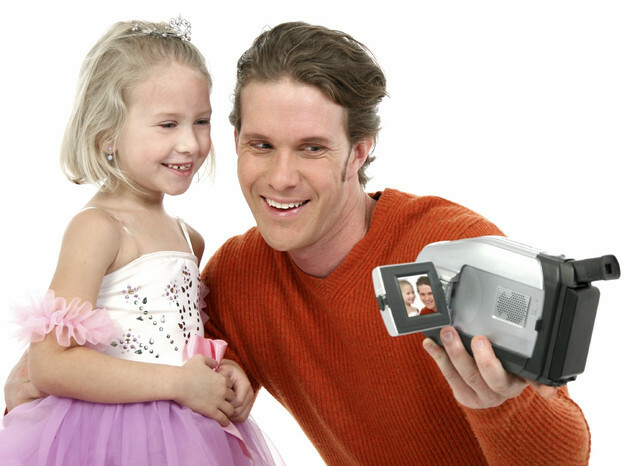 It might not be your crowning moment, but it was probably the most fun you’ve had with a video camcorder. Maybe you have some of these old videos stashed away in your garage, loft or even hidden under the bed. If you have, then we can help transfer them to DVD for you. For more info about your affordable VHS to DVD transfers, just contact us on 0800 592433 and we’ll be happy to help. This entry was posted in Blog, Gift Ideas on October 16, 2014 by admin. How do you feel when you remember certain times in your life? Joyous, warm and happy – we’re sure you’ve found yourself smiling outwardly because of what you’re thinking about! Just imagine giving this gift to somebody that you love – how would they react? Remembering brings back emotions and makes you feel young again, which is why it’s a fantastic gift for special birthdays and anniversaries. A Gift that Just Keeps On Giving! With a home movie or photo album, your gift will live on forever. The loved one who is receiving the gift will be able to look through an album or stick on a home movie whenever they feel like it, therefore the gift of memories is certainly a gift that just keeps on giving! There is nothing more personal and unique than this gift – you cannot buy memories from a shop! Well, we can help you to transfer your old films, however you’re the one who has created the memories, making this gift wholly unique; no one else will have it but you and whoever you’ve given a copy of the film to! You can make it even more special by creating a personalised cover! Nothing shows you care more than a thoughtful gift, and this is exactly what an old home movie on DVD is. It shows that you’ve gone to a real effort to give a gift full of meaning, rather than simply buying a cheap pair of socks from the supermarket! So, if you truly love someone, give them the gift of memories to show that you really care! It‘s wonderfully personal and will certainly help you both to remember the happy times forever! So go on, bring your old memories to life again! At Video2DVD we’re specialist in VHS to DVD transfers, and we always provide our customers with high quality products! For more information about how we can restore your memories, please get in contact with us – call 0800 592433 or 01926 461505 to speak to us today.